Now that he's been excluded from the first presidential debate, Libertarian Party nominee Gary Johnson is campaigning for a spot at the second one. "You know, the clock does keep on ticking," Johnson said on CNN's "Reliable Sources" on Sunday. Johnson is still talking about becoming president even though political experts say there is no viable path. And Johnson denied that he and his running mate William Weld are feeling pressure to drop out. CNN commentator Carl Bernstein said on "Reliable Sources" that his sources indicate Weld is "thinking about dropping out of this race if it looks like he and Johnson might get Trump elected." Specifically, Weld could "renounce his candidacy and go out and help Hillary Clinton," Bernstein said. In a statement on Sunday afternoon, Weld responded: "Gary Johnson and I will campaign with all our strength to make that case to the American people from now until November 8th. Under no circumstances will our energies be diverted from our goal of winning the election and serving our country." Weld attributed Bernstein's reporting to "wishful thinking on the part of the two-party duopoly." Related: Are Donald Trump's defenders choosing 'Trumpism' over conservatism? The Libertarian party ticket is receiving 9% support nationally, according to CNN's latest Poll of Polls. While this is far more support than the party has received in past presidential elections, it is not enough to meet the 15% threshold set by the Commission on Presidential Debates. "We have got to establish criteria well in advance... We did that last fall," commission co-chair Mike McCurry said on CNN's "Smerconish" on Saturday. The commission is a bipartisan group that organizes the general election debates every four years. "For a year now, the campaigns have known that they have to reach that 15% threshold. Some members of our commission thought that was too low. Some thought it was too high. We had a long debate about it," McCurry said. The criteria are applied before each debate, which means Johnson could conceivably be invited to the second and third debates if his poll numbers improve. 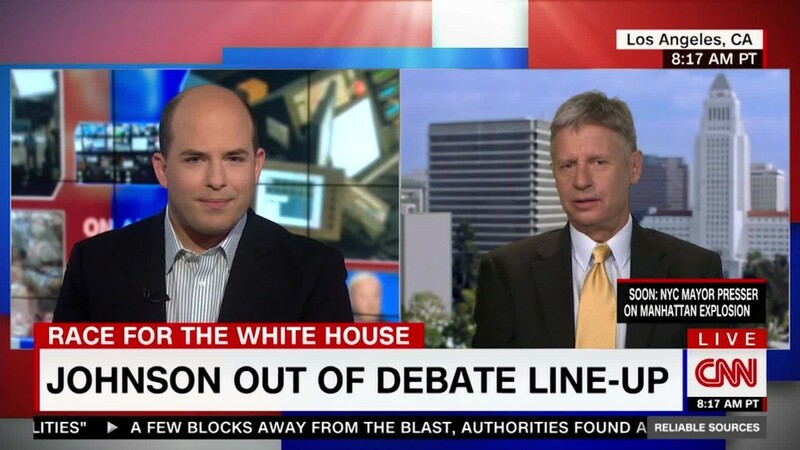 Johnson said on "Reliable Sources" that "70% of America right now doesn't even know I'm in the race." Johnson and Weld will receive a close-up on the most-watched news program in the country, CBS's "60 Minutes," on Sunday night. He said on CNN that the two-party structure in the United States "needs to be ruined." "They have done this to themselves. They have become so polarized. Their only agenda is to kill each other." -- Additional reporting by Eli Watkins.